The rotary screw air compressor is another of the types of compressors used by industrial and DIY compressed air users. Need to know a bit more about them? Looking for information to help select the right rotary screw compressor? You’re on the right page. 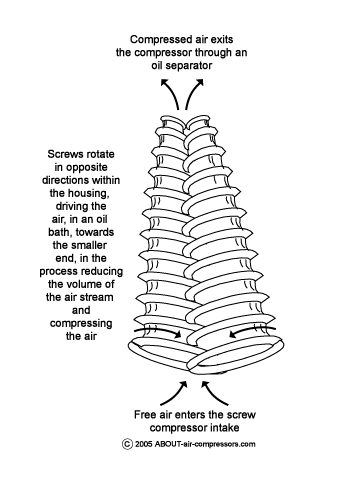 To give you some idea of how a rotary screw air compressor works, consider this. If you have ever used an electric drill in a piece of wood or metal, you may have noticed that the chips or spirals of metal follow the contour of the flutes up and out of the hole. Most of them, at least. A similar sort of phenomenon occurs inside the rotary screw compressor housing. At the wide end of the screw (sometimes there is one screw operating against a housing, sometimes more than one) an inlet valve allows free air into the screw housing when there is a demand. Free air flows into the housing from the outside as there is a partial vacuum formed inside the rotary screw housing as the screw(s) rotate. Inside the screw housing are the screws in a bath of oil. The oil is there to provide a viscous, flowing, sealing method to help trap the air in the rotary screw flutes. The air / oil mixture in the screw housing moves along the flutes from the wide end of the screw towards the narrow, pulling a vacuum behind, this drawing more air into the screw housing. As the air / oil blend is pulled along the flutes of the screw the space in which the air is contained gets smaller and smaller. The diameter of the screw is larger at the inlet end, and smaller at the discharge end – thus compressing the air. The amount of air trapped in the screw flutes does not change as the air is moved along the narrowing path, but the volume that air is in gets steadily smaller, thus compressing the air. Manufacturers of rotary screw compressors, have their own ideas of what constitutes the ideal geometry of the screw within their air compressor. 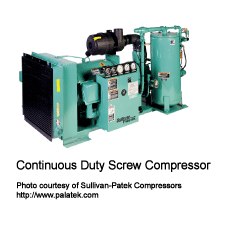 Rotary screw compressors may have just one screw (also sometimes known as augers) or there may be two or more. Single screw compressors function the same way as multiple screw units, with the air being compressed between the housing of the screw compartment and the screw itself, rather than between two or more screws. The following drawing is to provide a concept of how the rotary screw compressor works with two screws. The actual guts of the rotary screw compressor, including the shape of the manufacturer’s rotary screws, will vary depending on the design of that company’s compressor. The drawing shows two screws. They would be housed inside the screw compartment of the compressor, in a bath of oil. At the narrow end there would be an outlet valve which feeds the compressed air /oil mixture from the screw compartment and into a separator. The separator has the job of removing as much oil from the compressed air as possible, and then to release that compressed air into the compressor receiver or into the plant main air lines. This next drawing depicts the operation of the rotary screw compressor screws, provided by Kaeser Corporation and used with their permission. Although rotary screw compressors are available in lower horsepower ratings, it would appear that it is in the 20-25 horsepower and-higher-range that many industrial compressor applications tend to move towards using a rotary screw compressor solution from other types of compressors. One major manufacturer states that the rotary screw air compressor has become the most popular source of compressed air for industrial applications. That may be because of the need for a compressor with a continuous duty cycle. Some rotary screw compressor manufacturers claim a duty cycle of 24/7/365, which is pretty incredible for any electro-mechanical device. Rotary screw compressors are available with a direct motor-to-screw drive, others are belt driven. Each have their benefits, their own drawbacks, and the details of which are best obtained from the actual compressor manufacturer. The perception may be, and one that is claimed by some manufacturers, is that rotary screw units have the least maintenance issues of all types of air compressors and are touted as being the easiest to maintain both in terms of regular maintenance and unscheduled downtime. When you move up into the higher horsepower units, rotary screw units are reputed to be lower cost to purchase over a comparably sized reciprocating compressor and further, they boast lower operating costs than either vane or reciprocating units. Others suggest their oil carryover from the compressor into the compressed air supply of the plant is calculated in parts per million per day, that rather than the ounces or more of oil that can enter the plant air-stream from older reciprocating models and some well-used vane models. Other firms suggest that their rotary screw units boast a very low operating decibel rating, and claim noise output levels far below other types of compressors, an important issue to be considered for the benefit of workers in the area. It is our experience that the lower operating sound levels may not eliminate the need for a soundproof housing, unless the compressor is well equipped with sound-deadening cladding. As noted in various locations in this site when you are moving towards selecting a rotary screw ( or any compressor type), you first need to know how much air you’ll need in CFM at the PSI you need for your plant, your tools, and all ancillary equipment for now, and for the future. You’ll want to build-in excess volume available, as one statistic we’ve seen says, on average, more than 10% of all compressor capacity is lost through leaks, despite the best efforts of the plant to reduce wasted air. Once you got the compressor size figured out then you will want to review the up-front cost of compressors from a host of manufacturers. Check their mean-time-between-failure rates, their parts and service costs, the life expectancy of the unit with the duty cycle you will require, and what that particular operating costs are. 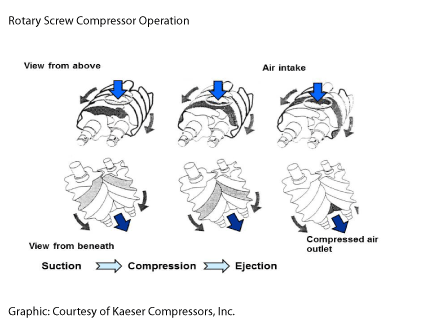 Compressing air is expensive, and one compressor might provide lower up-front capital costs, yet end up being far more expensive in the longer term due to higher operating costs. All factors having been considered, and certainly this is claimed by many of the manufacturers of this rotary screw type of compressor, the Rotary Screw compressor may surface as your best choice for your industrial application. There is a form below which you can use to ask a question about your Rotary Screw Air Compressor. Have a new question about a Rotary Screw Compressor? Please add your question here, and be sure to upload photos as they almost always help others help you with your compressor issue.